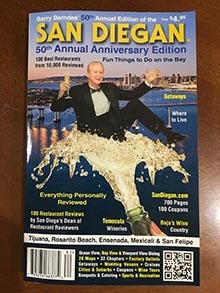 Posted July 19th, 2009 by Barry Berndes & filed under American, American, Banquets & Catering, California Coastal, California Coastal, Coronado, Coronado Restaurants, Restaurants. Posted July 17th, 2009 by Barry Berndes & filed under Asian Fusion, Banquets & Catering, Bay View, Breakfast & Brunch, Buffet, California Coastal, California Cuisine, Cantonese, Corporate Meeting Venue, Downtown Weddings, Hawaiian, MCRD Graduation Party Venues, Mediterranean, Military Wedding Venues, Party Venues, Point Loma, Point Loma & Shelter Island Weddings, Point Loma Breakfast, Polynesian, Rehearsal Dinners, Restaurants, Restaurants, Seafood, Seafood Fine Dining, Shelter Island, Shelter Island Restaurants, Vegetarian, Wedding Venues. Posted June 15th, 2009 by Barry Berndes & filed under 44th Edition OR, American, Asian Fusion, Banquets & Catering, Breakfast & Brunch, California Coastal, California Coastal, California Cuisine, Liberty Station, MCRD Graduation Party Venues, Point Loma, Point Loma Breakfast, Point Loma Restaurants, Restaurants. 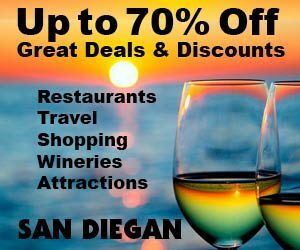 Posted May 12th, 2009 by Barry Berndes & filed under Attractions, Banquets & Catering, California Coastal, Corporate Meeting Venue, North County, North County Inland Weddings, Rancho Bernardo, Rancho Bernardo Restaurants, Restaurants, San Diego Wineries, Wedding Venues. Posted April 19th, 2009 by Barry Berndes & filed under American, Banquets & Catering, California Coastal, California Cuisine, California Mediterranean, Coronado, Coronado Restaurants, Corporate Meeting Venue, Happy Hour, Ocean View, Restaurants, Restaurants. Posted April 16th, 2009 by Barry Berndes & filed under Banquets & Catering, California Coastal, Continental, Corporate Meeting Venue, Happy Hour, La Jolla, La Jolla Restaurants, La Jolla Weddings, Ocean View, Restaurants, Wedding Venues.